Furled staysails are easy to hoist rolled and can be deployed or doused from the cockpit. In marginal conditions the sail can be struck instantly without changing the trim of the boat. Multiple stacked races of Torlon® ball bearings ensure smooth operation under load. 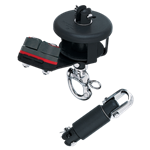 Systems include a lower drum with snap shackle, fairlead and Cam-Matic cleats, and an upper swivel with provision for halyard attachment. Gennaker furling was developed for large singlehanded boats and huge oceangoing multihulls. The drum unit features a fairlead, while the upper swivel is designed for direct halyard attachment. Custom designs are available for larger boats. 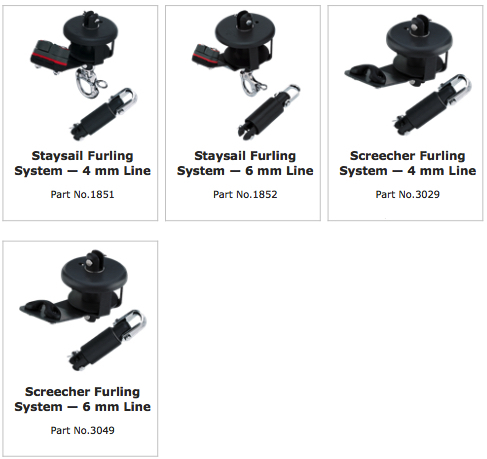 Use screecher furling systems on multihulls up to 9.60 m (32') and easily driven sport boats. Perfect for jib reaching, screechers are set on the bowsprit. They are often carried upwind in light to moderate conditions and used as storm spinnakers when it’s blowing. Systems are sized to handle loads of 2:1 halyards. Multiple stacked races of Torlon ball bearings ensure smooth rotation under load. Fairleads allow the furling line to lead aft to the cockpit.